The long lines. The camping out. The crazed ladies. The 4am wake up calls. (Ok its more like 6pm food coma wake up calls now!) Love it or hate it, Black Friday is upon us! In the midst of the chaos, Black Friday is a goldmine full of bargains! For those brave enough to face the crowds, today's post is about how to score great deals the day after Thanksgiving. I hope to inspire you to step out on Black Friday OR help you decide if it's really worth your time. Figure out what you're in the market for! This is one of the biggest keys to success, in my opinion. For certain big ticket items, Black Friday is the day when you can buy them at rock bottom prices! I find that tech items are always extremely discounted. If you're in the market for a new computer, camera, TV, appliance, or other tech gadget, this might be the day to buy! Do your research! Before going out and enduring the long lines and crowds, do some research on the items you're wanting to buy. Go on Google and search what the current price tag is at various stores. Look for the item on Amazon and other retail stores, who has the best price? This will make it easier to compare prices when the ads come out. You'll be prepared and able to assess if the items are worth buying. Shop smaller for the best deals on clothing! Walking into big retailers like Macy's, Kohl's, or Target on Black Friday can be so overwhelming. If you're only seeking deals on clothing for a wardrobe update, I suggest going to smaller stores at your local mall. I find that stores like this often have AMAZING deals on Black Friday and are a more manageable endeavor. Stores like the Gap, Banana Republic, the Loft, Ann Taylor, and J.Crew, usually have great deals, like everything in the store being 50% off! This is not including any addition sales that might be going on for cardholders or an extra percent off already reduced items. Make a list and strategize! Priorities. Priorities. Priorities. This is essential to Black Friday shopping, as it is to life! Figure out what's the top priority. I would encourage you to start with the item that has the deepest discount. Other things to take into account are customer demand, length of lines, and level of necessity. For example, the DVD that you've been eyeing that's on sale for $5 might need to be pushed to the bottom of your list. Grab a local newspaper! I know it's the 21st century and newspapers are on the way out, but sometimes I'm an old-fashioned gal who likes to hold an actual paper! Some stores have released their ads online, others hold off until the day before. I know it sounds ridiculous, but I always look forward to sifting through the mountains of Black Friday ads before watching the Macy's Thanksgiving Day parade. Grabbing a newspaper will allow you to have access to every ad, and you might see a great deal at a store that you might otherwise not have visited! Last year, my first stop was Best Buy because of an item that I saw in an ad. I usually never even stop by there! Here is a link to a news article that has a summary of Black Friday details and online ads! I hope this helps you tackle the beast that is Black Friday shopping! Comment below and let me know what deals you score! P.S. 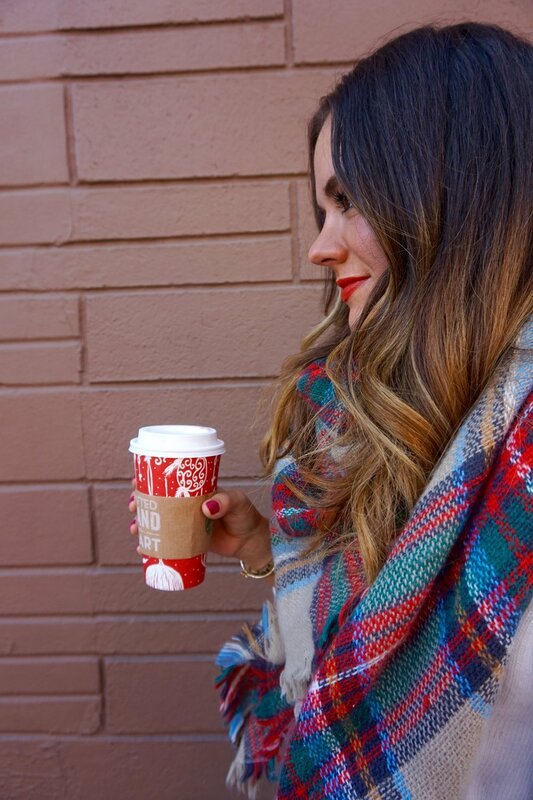 If you haven't enjoyed a Starbucks beverage in their new holiday cups, you need to! It'll put you right in the Christmas spirit!